Windows, doors and skylights are a major source of heat loss in Canadian homes. Strassburger ENERGY STAR® energy-efficient windows and doors will reduce energy consumption in your home, increase your level of comfort, cut down exterior noise levels and create less condensation in cold weather. By reducing your home’s energy consumption, Strassburger ENERGY STAR® windows and doors also help reduce greenhouse gas emissions. 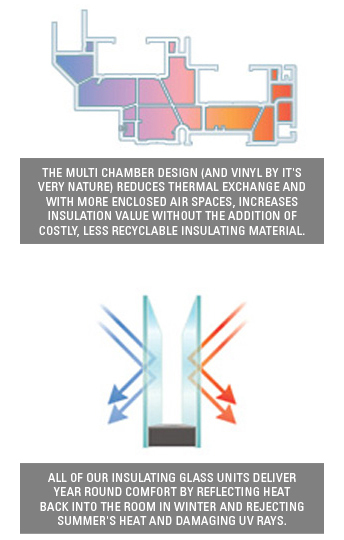 Thanks to their exceptional insulating capabilities – along with excellent performing glass options – our multi-chamber design reduces thermal exchange better than other brands, With more enclosed air space our design increases insulation values, without the addition of costly, less recyclable insulation. Replace all the original windows and doors in an average older home with Strassburger ENERGY STAR® qualified products, the household energy consumption would be reduced by about 7 percent and greenhouse gas (GHG) emissions by 3/4 of a tonne annually. When Strassburger ENERGY STAR® qualified windows are installed in an average new home, energy consumption can be reduced by about 12 percent. Our products meet strict technical requirements for both thermal and structural performance. Our products are qualified based on either their U-value (rate of heat transfer from a warm area to a cold area) or their Energy Rating (a scale that takes into account a product’s U-value, potential solar gain and air tightness). To ensure the integrity of the ENERGY STAR® mark, all product testing is done by accredited laboratories under standardized, quality-controlled conditions. The complete Strassburger window line has been independently tested and certified, so installing them in your home will help reduce your energy consumption and save you money. An ultra high energy efficient benchmark.